The B-24 Liberator was built in greater numbers than any other US WW2 aircraft, and served in every theater of WW2, as heavy bomber, anti-submarine aircraft, reconnaissance and transport. Produced in several factories, there were many variations, both minor and major, and existing literature is confusing and inaccurate. 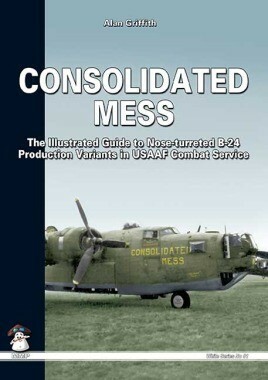 This book describes the development of nose-turreted versions of the B-24 as used by the USAAF, from field modification of early variants through to the many production versions built by Consolidated, Ford, and others, up to the definitive single-tailed B-24N. All aspects of the airframe are covered, from nose to tail, and the bewildering variety of turrets, guns, windows and other areas are described and illustrated. Much of this information has never been published before, and much that has been published is incomplete or inaccurate. Profusely illustrated with photos and detailed scale drawings, this book provides aviation enthusiasts and modelers the first complete guide to this major warplane. Future volumes will cover early versions without nose turrets, transport and anti-submarine versions, and non-USAAF variants.